END CAP (left) shown above. Sets include 1 Left and 1 Right. 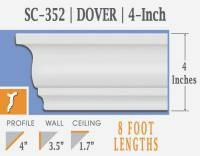 SAVE 10% USE COUPON CODE "SAVE10"
All of our crown molding is made in Germany.